OK this sounds pretty cool! AUSTRALIA — February 6th, 2015 — Logitech (SIX: LOGN) (NASDAQ: LOGI) today announced a transformation in communication. The new Logitech® ConferenceCam Connect is a portable all-in-one videoconference solution with a breakthrough design for small and medium sized rooms. 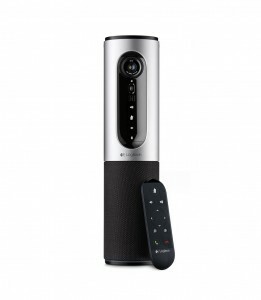 It works with any computing device with a USB connection (PC, MAC®, or Chromebook™), with virtually any videoconferencing system (Cisco Jabber® and WebEx®, Citrix GoToMeeting®, Blue Jeans®, Google Hangouts™, Lifesize®, Microsoft® Lync™ and Skype™, Vidyo®, Zoom®, etc. ), and it can be easily moved from room to room. “For about the cost of an office chair, businesses of all sizes can now afford to quickly connect with customers, vendors and remote employees anytime and anywhere with the Logitech ConferenceCam Connect,” said Jason Moss, general manager of the Collaboration Group at Logitech. “We believe there is simply no workspace that should not have video conferencing capability, and the ConferenceCam allows us to connect to meetings no matter where we are.” “Teams are collaborating more frequently than ever before, sharing content and using video conferencing to connect with both local and remote team members,” says Bill Haskins, Sr. Analyst and Partner at Wainhouse Research. 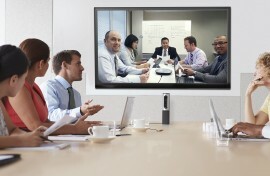 The ConferenceCam Connect has PC and Mac compatibility for video conferencing, and mobile connectivity for screen-mirror projection. Windows and Android users can connect wirelessly to the ConferenceCam Connect to screen-mirror presentations, spreadsheets, videos or Internet content from a mobile device to a TV screen through an HDMI connection. The ConferenceCam automatically connects to the display, eliminating extra steps like TV input selection.